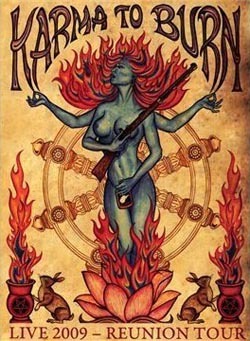 The stoner rock legend Karma to Burn celebrates its rebirth with an audiovisual blow by presenting its loyal followers with the DVD "Live 2009 - Reunion Tour". As the title indicates, the Reunion Tour, shot at 3 different locations, takes centerstage, while the viewer experiences this sweaty affair from the front row. The V.I.P. experience is further enhanced by the extensive bonus material included in the package (extra footage of the Reunion Tour, the Dynamo Open Air 1997 show, and much more). A true epiphany for worshipers of powerful riffs looking for the long lost stoner rock paradise.